This article is about the armor worn by the Arbiters. For other articles including "Arbiter", see Arbiter (disambiguation). Thel 'Vadam wearing the traditional armor of the Arbiter in November, 2552. As befitting the great honor associated with the title, each Arbiter of the Covenant is issued a unique set of traditional body armor. Every Arbiter is given an ancient suit of armor that fits their size, and the armor itself always follow an age-old traditional design that dates back to before the Covenant. Multiple suits of armor are stored in the Mausoleum of the Arbiter, and an individual suit will be mourned if it is lost. Unlike the sleek, glossy armor worn by most Sangheili, the Arbiter's armor is made of a dark silvery-bronze metal and is more akin to a suit of human medieval armor. Notably, it includes a distinctive helmet with a curved hawk-like "beak" covering the face. The armor is secured to the Arbiter's combat suit by blue form-fitting straps and is composed of various segmented plates. A porous, form-fitting underarmor is worn under the metallic plates. During the Taming of the Lekgolo, an unidentified Arbiter was given a Ranger harness retaining the aesthetics of the default body armor design. After the Human-Covenant War Thel 'Vadam started wearing a custom-built ceremonial battle armor intended to pay homage to past Arbiters and symbolize his newfound role as a leader of his people. Like the standard Sangheili combat harness, the Arbiter's armor is equipped with an energy shield. It also possesses active camouflage capabilities, but this feature can only be enabled for a limited time, as opposed to the armor of Spec-Ops Sangheili, as the armor and its functionalities are somewhat older than current Covenant technology. In Halo 2, the Arbiter armor lacked the distinctive mandible guards seen in Halo 3. The most likely explanation is that the current Arbiter added them himself. The armor worn by Ripa 'Moramee. The armor worn by Fal 'Chavamee. The armor held inside the Mausoleum of the Arbiter. Thel 'Vadam wearing traditional Arbiter armor in October, 2552. Thel 'Vadam wearing his custom-built Arbiter armor in 2558. 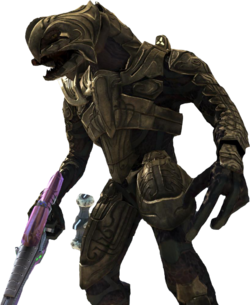 A pre-Covenant Arbiter wearing armor. The Arbiter Ranger armor worn by the Arbiter during the Taming of the Lekgolo. The armor worn by the Arbiter during the Unggoy Rebellion. Thel 'Vadam wearing his armor shortly before the Battle of Sunaion. Thel 'Vadam wearing his armor.